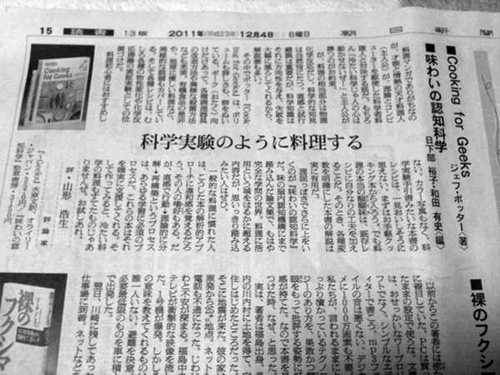 I’m told that Asahi Newspaper is the most prestigious newspaper in Japan. 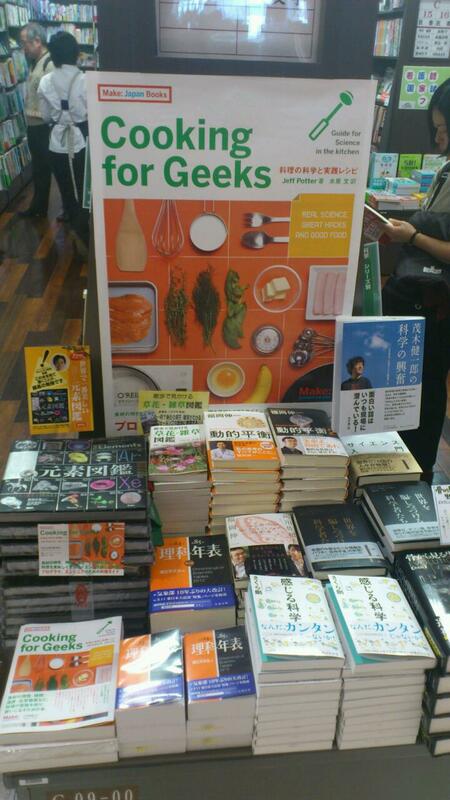 They reviewed the Japanese edition of my book: Ｃｏｏｋｉｎｇ　ｆｏｒ　Ｇｅｅｋｓ　[著]ジェフ・ポッター／味わいの認知科学　[編]日下部裕子・和田有史 The writer of this article is YAMAGATA Hiroo (山形浩生), who is a famous critic and translator. Photo by MIZUHARA Bun; translation by TAMAGAWA Ryuji from Osaka, Japan. But a large part of cooking is done with chemical changes and it is obvious that chemical knowledge is useful. Though intuition and trial-and-error are important, scientific knowledge shows you the right direction to avoid mistakes. That is the reason why we have so many guide books. “Cooking for Geeks” by Jeff Potter is outstanding in quality and quantity. It is truly a book for geeks, with rich contents such as how to adopt various cooking tools and surprising cooking methods. The book also covers related topics like organic foods and dishes that have less of an impact on the environment. In this book, recipes are demonstrations and experiments. I do not recommend this book for cooking novices. There are no color pictures. The recipes look like science experiment manuals and do not seem delicious at the first glance. You should start with easy cooking guides. However, you will not understand the real fun in cooking until you start to make your own changes to recipes. Then, the explanations in this book come to the rescue. “Cognitive science of Taste (Ajiwai No Ninchi Kagaku)” is more theoretical. It is a collection of papers which dives into the taste cognition system in the brain and completely an academic book. The contents are far beyond from being useful for cooking, but if you want to dive deep, you should read this. The analytical approach of these books gives you strange feelings if you are used to popular recipe books. Some people will like this approach while others will not. But the process of institutional trials -> theoretical analysis -> reorganization is an essential process for any learning. These books will certainly help you in the process. And when you do, you’ll find that the dishes that result from the “cold science” aren’t bad. Give it a try!